An online bicycle rental opportunity has proven beneficial for Tri-Sports.com, the Tucson-based business specializing in triathlon equipment and training. 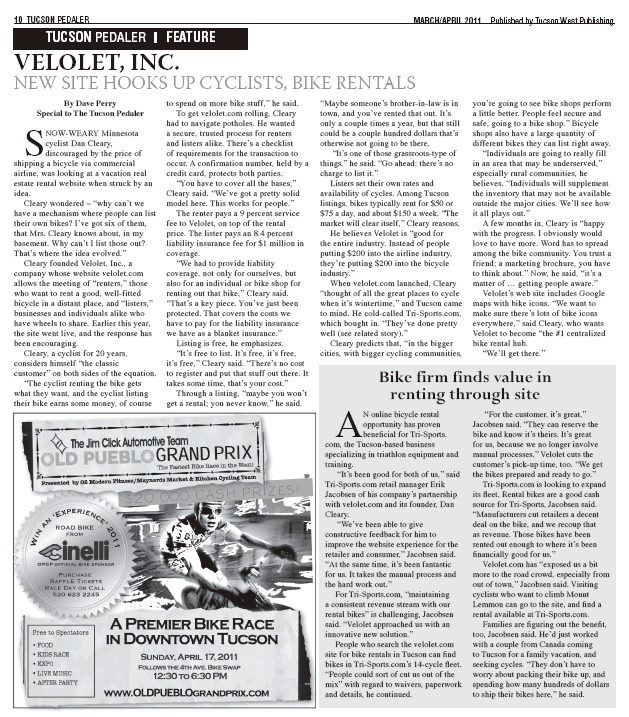 People who search the velolet.com site for bike rentals in Tucson can find bikes in Tri-Sports.com’s 14-cycle fleet. “People could sort of cut us out of the mix” with regard to waivers, paperwork and details, he continued. Velolet.com has “exposed us a bit more to the road crowd, especially from out of town,” Jacobsen said. Visiting cyclists who want to climb Mount Lemmon can go to the site, and find a rental available at Tri-Sports.com. Families are fi guring out the benefit, too, Jacobsen said. He’d just worked with a couple from Canada coming to Tucson for a family vacation, and seeking cycles. “They don’t have to worry about packing their bike up, and spending how many hundreds of dollars to ship their bikes here,” he said. This entry was posted in Press and tagged bike rental, velolet. Bookmark the permalink.